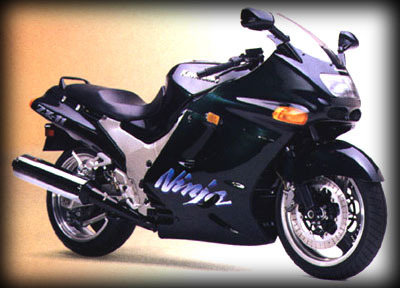 Others have tried to top Kawasaki's heritage for building the meanest, baddest high-performance sportbikes, but there still stands one bike head and shoulders above the rest: the Ninja ZX-11. The only open-class bike to offer you the seductive power advantage of Kawasaki's Twin Ram Air Induction that's made history as the open-class performance king for seven undisputed years. With its 16 lightweight valves weaving magic inside the cast alloy, DOHC cylinder head and a quartet of gaping 40 mm semi-flat slide CV carbs force-feeding smooth, straight intake tracts, the flagship Ninja screams excitement. And with its light yet incredibly stiff aluminum, full perimeter frame and technically advanced suspension and chassis, all this performance is under your full control. But be warned. Once you've tried it, you'll never settle for less. Suspension, rear Bottom-Link UNI-TRAK with gas-charged shock, adjustable preload and 4-way rebound damping.